Adolf Eichmann is trying to murder as many Jews as he can;President Roosevelt is two-stepping around the Jewish issue; Peter Bergson is organizing the world to save Jews and get them to Palestine; Vrba and Wetzer dramatically escape from Auschwitz and write a report, and Jewish Rudolph Kastner is negotiating in Hungary with Eichmann, for the lives of the Budapest elite. 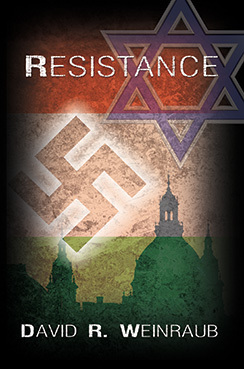 From Heroic action with Darby’s Rangers in Europe and Africa, to creating an underground resistance force that plays a fascinating sinister cat and mouse game with Adolph Eichmann to save Hungarian Jews from Auschwitz, a young Jewish-American former college football player, Lieutenant Ben Brodsky steps up. Despite romantic complications, Ben teams up with courageous Swedish envoy Raoul Wallenburg and the stunning Rebecca Goldenberg, to try to stop the Nazis and get survivors to Palestine. The author not only tells the politically incorrect truth about the failure of our inner city, neighborhood schools, but then offers a realistic, low-cost plan to help fix them. Dr. Weinraub provides his "Twenty-One Steps for the 21st Century Program" that includes his "National, Standards- Based, Flow-Thru Curriculum with Small Group Instruction." This concept is immediately doable in all our schools, urban and suburban. FOR THE FIRST TIME, an author not only presents the dismal facts about our inner city schools, as well as common-sense solutions to the problems, he then weaves his suggestions into two compelling novels that deal with the inherent conflicts and tensions facing a new principal of an inner city, neighborhood high school. 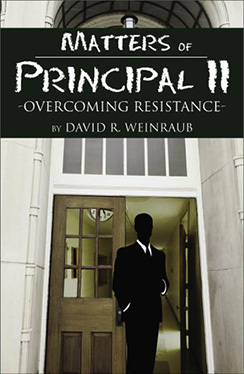 "Matters of Principal" and "Matters of Principal II"
Faced with the mayhem, crime, drugs, poverty, rudderless kids and two-way racism present in most inner city schools, Dr. Dan Tabas also has to overcome the malaise and status quo mentality of central administration, if he's to stimulate positive and effective change. His biggest challenge is to develop a common sense, realistic plan for controlling and improving a dysfunctional, inner city, neighborhood high school. With the help of Lauren Lindbergh, his vibrant assistant principal, the two reform almost every accepted educational strategy and decision making process. Special attention is given to the careers of five teaching interns, the discovery of a thirteen year old genius, and the surprising events that change people's lives. Along the way, there are gang fights, mace attacks, racially motivated character assassinations, murder, and the building of a prosperous drug trade by a female student. 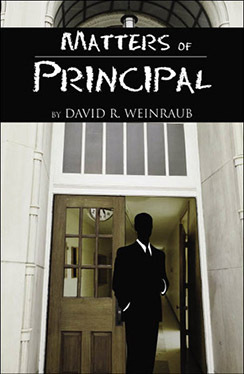 authored by David Weinraub. To read this article, click here. 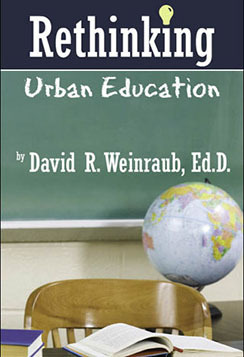 David R. Weinraub earned Bachelor's and Master's degrees from Temple University and a Doctor of Education degree, specializing in educational administration, from the University of Pennsylvania. Through his career he has been an inner-city teacher, coach, dean, assistant principal and high school principal as well as an assistant professor of graduate education. David received a national award for an outstanding Career Education program while principal and a grant from the State of Pennsylvania to design the Jr. Naval Academy Charter School for students returning from incarceration. 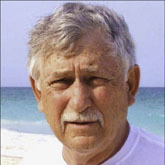 He also developed the first English prompted authoring (software) system for the IBM PC and helped many corporations design and implement, computer based training.